1882, New York. Stock certificate for 100 shares. Green/Black. Engraved vignette of a steam locomotive at top center, nice portrait vignette of Frederick Billings at bottom. Punch and stamped cancelled. The Pacific Railway Improvement Co Mpany Issued To And Signed On Verso By Restauranter Lorenzo Delmonico And Signed Twice On Verso In Morgan’s Hand Drexel Morgan & Co. Subscription certificate for $5,000 in stock and $10,000 in bonds. Signed twice on verso “Drexel, Morgan & Co,” by J.P. Morgan. New York. January 20, 1880. Issued to Lorenzo Delmonico and signed on verso. 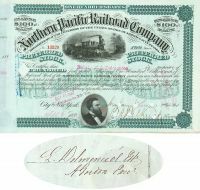 “The Pacific Railway Improvement Company made a public offer in 1880 for subscriptions for the first mortgage bonds of the Texas Pacific Railway Company. Funds were required for building a line between Fort Worth and Rio Grande, a distance of about 600 miles. The funds offered were of $1,000 denomination, bearing interest at the rate of 6 per cent per annum. As a inducement, the company offered for every subscription or $900 paid in addition to the first mortgage bond stock in the road to the amount of $500. The installments were to be paid whenever the Improvement Company required money to carry on its work. The subscribers received certificates upon which the amount of their respective payments was entered.” (New York Times, November 29, 1882) Signed on the front by Charles H. Woerishoffer. An interesting and unusual association.